Your freezer may remind you of the Siberian Tundra–a barren wasteland that you’re lucky to survive. But it doesn’t have to be. 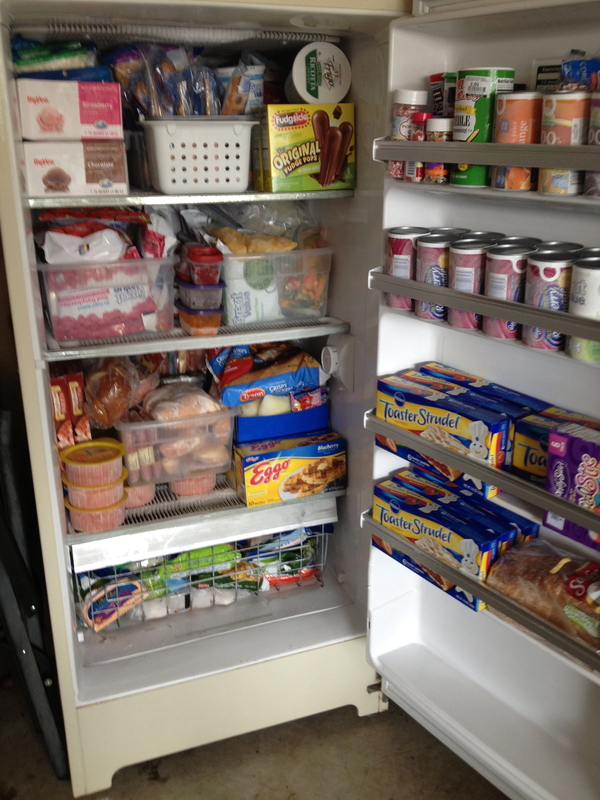 You freezer (and deep freeze) can help save you tons of money if you keep them well-organized, in a system that works for you. Make All Items Easily Visible. Our deep freeze (and freezer, and all food storage areas) are usually packed with food because we buy what is on sale and buy in bulk. But all of our items are easily accessible. We keep bins of items at the back and smaller items toward the front. Everything is stored so it’s easy to see, making it very easy to find. Label Mystery & Homemade Items. Everything makes sense to me as I’m putting it away, but if I don’t label an item for my freezer or deep freeze, that item usually becomes a mystery the minute it’s frozen, then when I try to use it in 3 months and it’s unlabeled the item really is a mystery. I now consistently label all of the items that will be frozen. All items have the name and the date on them. I will also sometimes put baking instructions on an item, especially if it’s homemade–makes it easier when I’m trying to prepare it later. 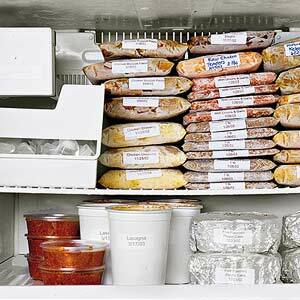 You will save so much time if you label all of your items before you freeze them. Boxed items can be stacked easily, but consider re-purposing bins for packaged items. You’ll want to keep all similar items (like mozzarella cheese) or categories (like frozen fruits/veggies) together so you know what you have and you don’t over buy items. Use the door for smaller items, like juices or spices. Freezer is for Frequent; Deep Freeze is Extended. I’ve mentioned many times to store items together to keep yourself more organized. And this is certainly true, but you need to also keep items where they’ll most be used. We currently have 5 frozen pizzas, but they don’t all need to be stored in either location. We keep one pizza in our freezer and the other four in our deep freeze. As we use the one in our freezer, I bring another one from the deep freeze so we always have one, and only one, in our tiny freezer. 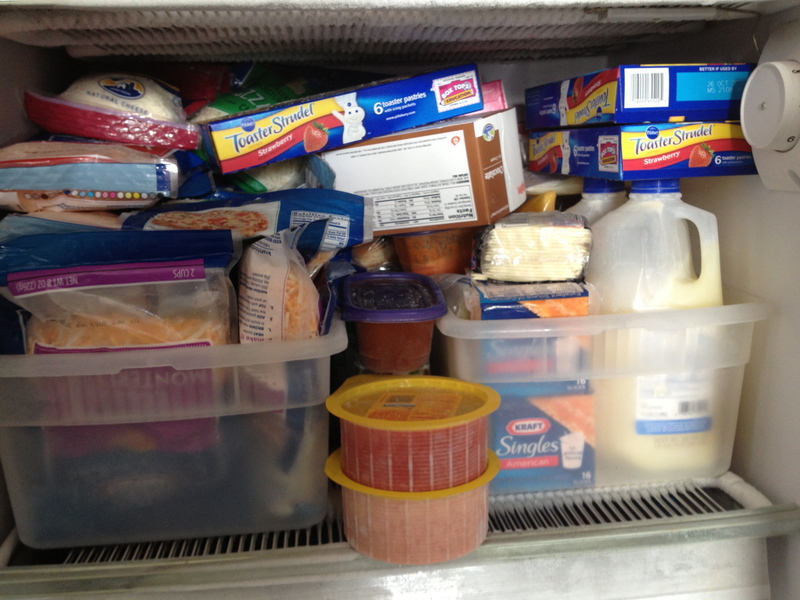 Keep a select few items in your freezer (attached to your fridge) and keep the other items in the deep freeze. By storing a select amount and frequently used items in your freezer, it makes them easily accessible when you need them. Wear Gloves When Organizing Freezers. Because I organize the freezer and deep freeze so often, I’ve picked up a few tips from the experts (Frozen Food stockers in grocery stores). I always wear gloves, because it saves my hands. 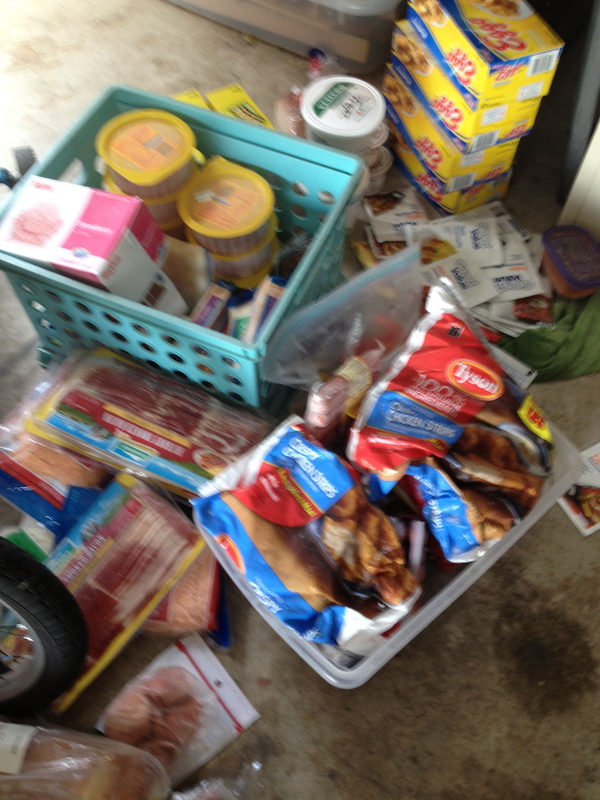 I also keep bins and tubs near the deep freeze to put food in as I’m updating my storage based on the quantity of items we have after a grocery shopping trip. 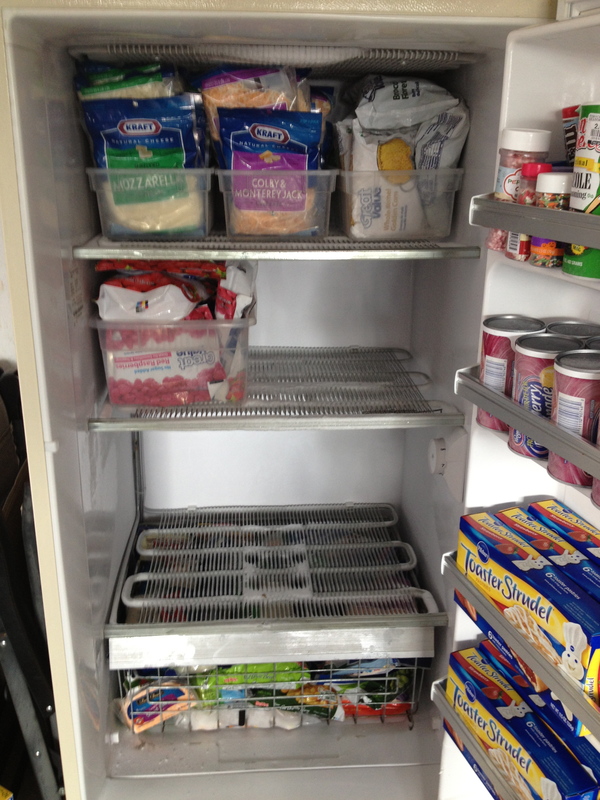 Your freezer, just like most of your home’s storage spaces should be frequently organized. This doesn’t mean they have to be perfect at every minute, in fact, find a system that works for you and stick with it. 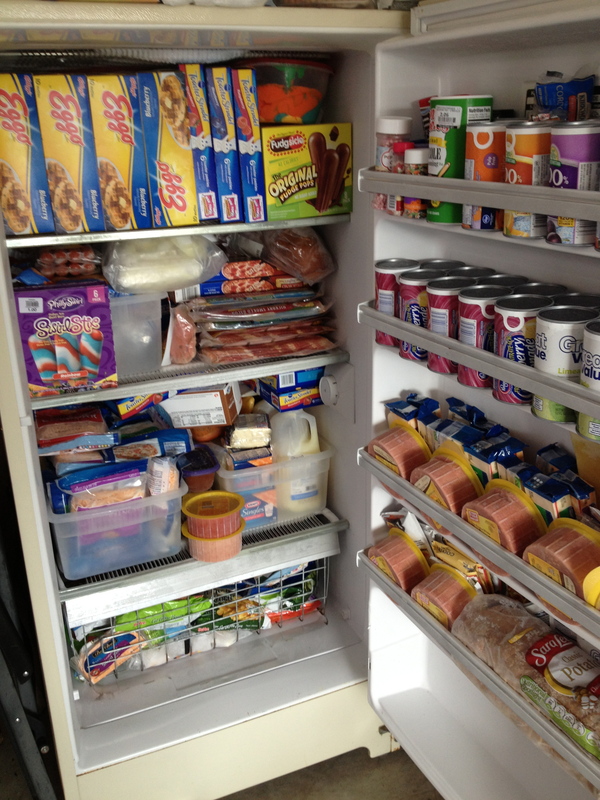 As I purchase new groceries, I jam them in the deep freeze until I have time to re-organize the section or the whole unit. And as I organize my items, I make sure that the newest items are stored at the back–helping me to use the oldest items first. 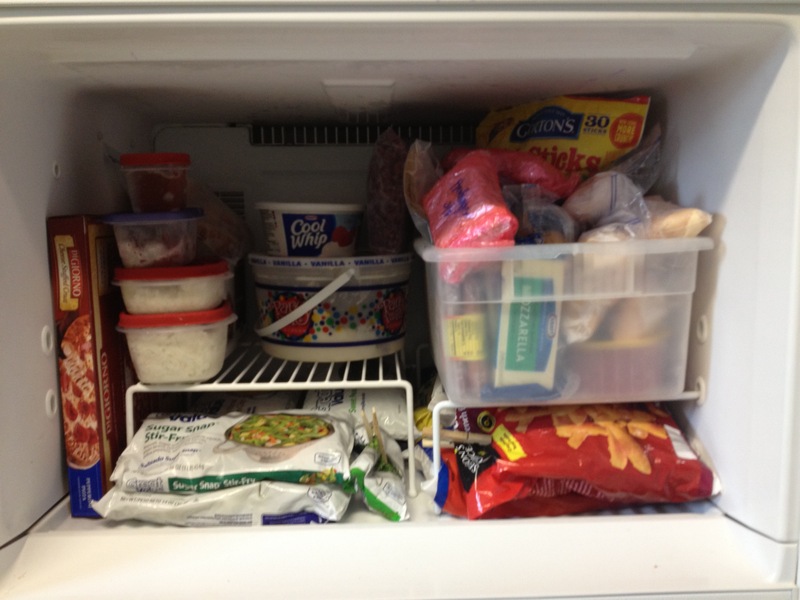 By treating your freezer as an active storage location, you make the most of what you have. Your food will last longer and freeze better if you follow a few simple basics. When freezing liquids, lay them flat as you freeze them in ziploc bags. This will make them flat and “fileable”Cut meats into serving-sized portions and wrap tightly in cling wrap, then foil and finally a ziploc bag. This reduces freeze burn on items. Don’t store delicate items (like ice cream) in the freezer door, keep them toward the back of the freezer so they remain frozen. Keep your freezer temperature between 0 and 5 degrees. Very interesting article. You may be interested in our Fantastic Freezer Converter we recently launched. I’d love to know your comments.